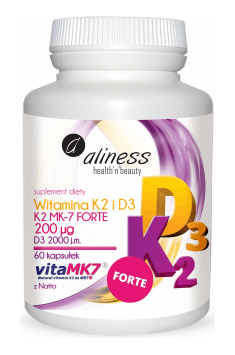 Aliness Vitamin K2 Forte MK-7 with Natto + D3 is a preparation in the form of convenient capsules created for people who want to provide an effective dose of two vitamins that support the health of the skeletal, immune and hormonal system, as well as improve blood coagulation. Vitamin K2 MK-7 (menaquinone) – a compound synthesized by the Bacillus subtillis natto bacterial strain during fermentation. Thanks to this, the compound is characterized by the best bioavailability of the form used and the full biological effect. Vitamin K2 participates in the maintenance of normal bone and joint structure, as well as supports blood coagulation and hormonal balance of the body. Vitamin D3 (cholecalciferol) – isolated from lanolin used to produce 7-dehydrocholesterol. The main role of the Vitamin is to supervise the proper calcium and phosphate management (especially in bones and joints), as well as to mobilize the immune system to fight intruders. Both vitamin K and D are found in several biological forms that differ not only in origin but also in bioavailability. Thus choosing the right form is a key aspect of supplementation and allows the achievement of particular effects.Quinones, that is the chemical compounds which include Vitamin K, are differentiated into several types. The most widespread is vitamin K2. It is produced in the body by intestinal bacteria. There are two subtypes of vitamin K2 – MK-4 and MK-7, the latter of which replenishes systemic deficiencies of this vitamin, and also constitutes the main action due to the higher bioavailability. Both intermediate compounds and vitamin D3 itself, are produced in the skin, liver and kidneys of a human body. Due to the small amount of sunshine (especially in winter), it is important to provide this vitamin externally. The ingredients contained in the supplement have been obtained in an entirely natural way – the process of bacterial biofilm purification takes place using carbon dioxide, and not harmful chemicals, as with other preparations available on the market. Thanks to this process, a product of almost 99% of purity has been obtained. Over the years, an increasing number of people complain about ailments within the osteoarticular system. The most common causes of these problems include overload, inadequate regeneration, as well as improperly balanced diet. All of them result in the weakening of the condition and the impairment of many functions of the locomotor system. Fortunately, there are plenty of compounds on the current supplement market that may support repair processes and prevent damage to the motor system. As shown, they are both vitamin K2 and D3. The key micronutrient that is included in the bone structure is calcium. It has been observed that cholecalciferol facilitates its absorption from the gastrointestinal tract, prevents its loss with urine, and enhances incorporation into bone tissue. Additionally, thanks to supplementation with vitamin K2, the level of osteocalcin increases, which indicates the stimulation of hematopoietic cells. In the face of these facts, it can be concluded that the synergistic action of these two biologically active compounds contributes to significantly better regeneration of the passive component of the musculoskeletal system. Hemostasis is the process of blood coagulation. Few people wonder about the role of vitamin K2 in the body. It is one of the coagulation factors that support the production of other proteins responsible for the inhibition of bleeding and hemorrhage. Without the proper functioning of the coagulation system, it would be impossible to heal even minor injuries, not to mention more serious injuries, in which a large amount of blood is lost. Therefore, it is worth acquiring the best-absorbed form of vitamin K2 to avoid symptoms of hemorrhagic diathesis and the subsequent serious health complications. In recent years, the study of immunological phenomena has become popular. Not only has been noticed the growing role of the immune system in defending the body against microbes but also that it can lead to the development of auto-aggressive diseases. Hence the reasonableness of supplementing our diets with compounds that regulate the immune system. Vitamin D3, acting on receptors on immunocompetent cell membranes, mobilizes them to act against pathogenic virus species. As a result, the body deals better with the developing infection and thus can fairly quickly limit its progression. As already mentioned, vitamin K intensifies the production of osteocalcin in bone tissue. This protein has a range of regulatory activities. Osteocalcin shows the ability to stimulate Leydig cells present in male testes, which are responsible for the production of testosterone, and thus the increases of its concentration in the peripheral blood. As a result, the attributes of masculinity improve – a sculptured, muscular body, neat facial hair and better sexual functions. In addition, insulin sensitivity of the tissues is improved, which occurs as a result of the increased insulin secretion as well as anti-inflammatory adiponectin. This contributes to the stabilization of glycemia and weight control. To sum up, Aliness Vitamin K2 FORTE MK-7 with Natto + D3 is an excellent supplement with a broad pro-healthy effect, which includes improvement of blood coagulation parameters, as well as prophylaxis of systemic diseases. The effective dose of vitamins contained in the preparation contributes to the improvement of immunity, the health of bones and joints as well as hormonal functions. Vitamin K2 FORTE MK-7 with Natto + D3 200mcg 60 caps. Take 1 capsule once a day during a meal. Both vitamins contained in the preparation act synergistically, especially in relation to the osteoarticular system. Taking that into consideration, the product is particularly recommended to people struggling with all kinds of problems related to the musculoskeletal system, in order to support its regeneration and prevention against further damage. People exposed to osteoporotic bone lesions are in particular postmenopausal women and the elderly, hence the preparation is directed to them. Vitamin K2 does not accumulate in the liver, so doses of 1000 mcg a day are still safe. Bulking agent: microcrystalline cellulose, bovine gelatin, humectant: glycerol, water. Powerful dose of EFAs directly from extra virgin olive oil, provides support for the circulatory system. Selenium in the best form of l-selenomethionine; beneficial for the functioning of the thyroid. Vitamin K exists in the triad of vitamins: menaquinone (vitamin. K1), menadione (vitamin. K2) and menadione (vitamin. K3), soluble in fat. It is produced by bacteria in the human colon. Natural sources of vitamin. K are: eggs, kale, cauliflower, cabbage, meat, milk, lettuce, spinach, fish oil and liver. The synthetic form is administered to newborns, to reduce the sterility of the gastrointestinal tract. Used as a antihaemorrhagic, due to its participation in the process of prothrombin. Increases antibacterial and antifungal immunity. Prevents abundant bleeding during menstruation of women. Vitamin K deficiency causes external bleeding and ecchymosis on skin, decreased prothrombin synthesis in the liver (especially while taking antibiotics and sulfanilamide).